Hello! Welcome to the colourful world of Spirited Moonchild ~ a small arts, crafts and photography business located in the beautiful, rugged seaside town of Newlyn in Cornwall. I'm a mixed media artist, inspired by my natural environment - frequently to be found gazing at nature, noticing small details that make up the world, walking along beaches picking up interesting pieces of driftwood and being generally fascinated by trees, plants, ladybirds and old stone walls! Does anyone else have this image.... that when you copy something ready to paste, it's kind of stored in the mouse until you paste it... or is that just me?! To gain a glimpse into my thinking process, if I saw something I wanted to keep and wanted to make sure I can find it again (somewhere on my computer), then I'll copy it (or a link) ready to paste somewhere so that I can find it again. But if, in the process of copying, I lose power to my computer, anything 'stored' in the mouse at the point where the power connection is lost also gets lost. Following?! Which reminds me of a funny story of when I first got a computer (in the days before the internet... unthinkable, isn't it - I mean, what the heck is the point of a computer WITHOUT internet?! No wonder I saw it as a glorified typewriter!) - I'd just learned about the copy function.... and used it to copy lots of the same symbols I'd found in an exploration of the character map onto a blank page (yes, I really did that!) to save in case I wanted to 'cut' one out and paste it into another document.... YET... at the same time, I also understood that when I started to run low of symbols (because of my very own 'cut and paste' technique) I could then copy more of the remaining symbols onto the same page to save to use next time! Why on earth hadn't my brain connected with the fact that, if I knew I could copy and paste, I only needed ONE of each symbol to do that?! Perhaps because my brain was used to the cut and paste technique used in collage, and other artwork?! 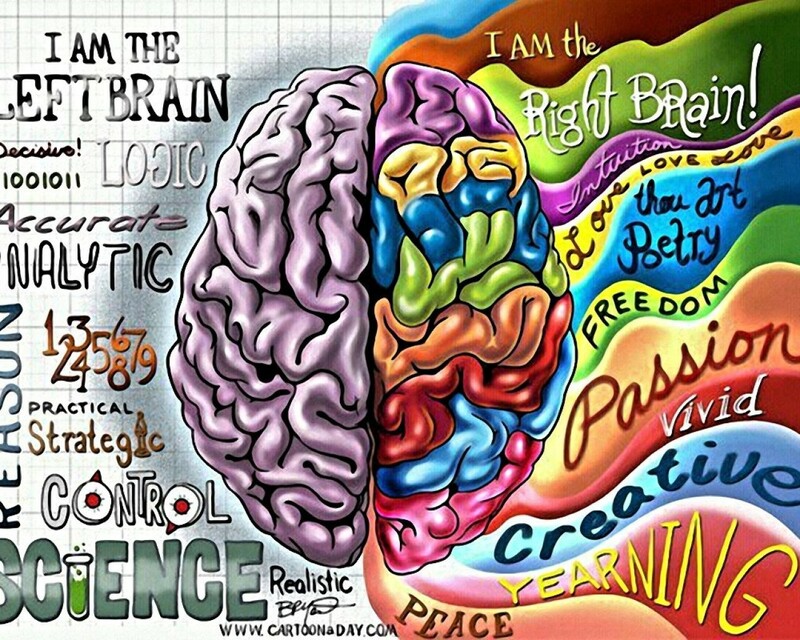 Which leads me into a theory of mine, actually, about the differences between left and right brain thinking - the left hemisphere, often said to be more logical, analytical and objective (more inclined towards the mathematical side of things), while the right side is more intuitive, thoughtful and subjective (leaning more towards creative pursuits). Clearly, from that, even though I am ambidextrous (meaning, I can use both hands), my earlier 'copy and paste' brain mentality showed a leaning more towards the creative side of things and lacked a certain logic even when in possession of the facts! Brains have always interested me immensely. I was 3 years old when I tripped and almost fell when out shopping with my mother. I know exactly where I fell because not only do I remember it, I still walk past there extremely often (right outside Penzance Post Office!). I tripped over the curb, Mum pulled on my arm to save me from falling. That was that. It was a week or so later when she noticed I wasn't moving or doing anything with my right arm or hand. I then ended up with my arm in plaster for 19 days and, for some reason unknown to me, I was kept in hospital the whole time - but not in the children's ward, I was put on an elderly people's ward where I wasn't even allowed to play with the toys in the children's ward during the day time! Instead, as a little girl of just 3 years old, I played with my (weird looking) panda toy, Peter, that had my name sewn into his ear and went round the old people asking for their tea dregs so I could pour them into the teapot of my treasured tea set to pour out into my little teacups and offer round again! I remember the old people chatting to me while they pretended to drink, being given Liquorice Allsorts, and watching as nurses came in and pulled curtains right round a particular bed, then the bed reappearing empty afterwards. There's something more to it than that... my mum told me in later life that she was once a secretary to a doctor who specialised in TB research and that she'd been worried I might have it....which might explain what I can see now was tantamount to being kept in isolation, in with those already on their way out and therefore not posing much of a risk if I had, though I've never understood why she thought that and can't ask her now. Incidentally, after 19 days of having my arm in a cast, it was realised I hadn't broken it at all, but by then I needed weeks and weeks of physiotherapy to get the use of my right hand and arm back! Anyway, point being - by 3 years old I was already using my left hand to do things while my arm healed. Had I been using it before? I don't remember, but that's when I believe my ambidexterity first began to surface. It's a useful thing to be able to do and I believe it helps balance my brain so I can be creative AND (largely, though as the above illustration demonstrates - not always) logical (not at all that I think the two things are automatically mutually exclusive). It might explain why, when people talk to me, I see their words in picture form and therefore need to focus my eyes on a 'quiet' spot while I'm listening to be able to see it, as eye contact gets too busy (by gazing into eyes you see into the soul which often has a different story it wants told - and although I'm happy to listen to that, YEARN to speak at that level, most often I've been informed I'm not paying attention to what's being said!). It might help explain why I can smell certain colours, why I am as confused today as to how a telephone works (nevermind the internet) as I was as a child - visualising empty yogurt pots tied together with a piece of taut string half way round the world. It might explain why, when you talk about a certain type of creepy crawlies I don't care to mention, there might as well BE one in the room and why I can't, therefore, bear you to talk about certain things (some may say 'over-active imagination', but how about 'good visualising skills'?!). It may also go some way to explaining why I maintain a very child like view of my world, bordering on simplistic, and why, when my logical left brain hemisphere goes to name a thing like 'mini-weetabix', it seems to merge that information with my creative right brain hemisphere so that the words that actually leave my mouth become 'wini meetabix' (which just happened! I do that a lot!)... enabling both sides of my brain to be employed and happy! Somewhere along the way the two hemispheres of my brain 'married' or merged, or at least, became very close friends. One did not favour itself over the other; BOTH are employed to assess my world. I think that has distinct advantages. And this is where computers come back into the story. Before computing, only writers and secretaries (that's a bit of an educated guess) tended to regularly use typewriters (once they were invented around 150 years ago), everyone else used predominantly their left or right hand to write. If anyone has ever seen the book 'The Way of The Artist' by Julia Cameron, you'll know there are exercises to do specifically with the left hand in mind to help regain or unleash creative talents and skills. 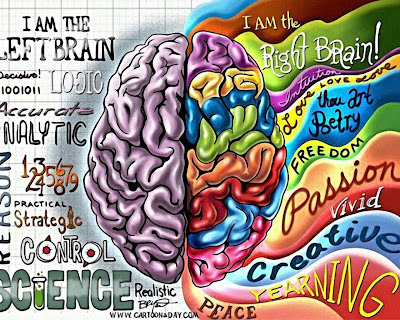 This is because the left hand is operated by the right side of the brain - the more creative hemisphere. My thinking is along the lines of this - with predominantly right hand writers, it's predominantly the left (logical, linear, analytical, objective) brain hemisphere being accessed, and the left and right hemispheres tend to process differently any information coming their way. If you notice (always exceptions to every rule though), the left handed people I've known do tend to lean more towards the arts, music and creativity in all its various forms. With the advent of computing as a way of life these days, more and more and MORE people the world over are learning to write (type) with BOTH hands (though I don't at all do it as I was taught in the few typing classes I received)... which, surely, can only help balance our brains out?! And maybe it's only because of the internet that we're hearing about all these things, but more and more people do seem to be being more creative - my newsfeed is FULL of creative, talented people producing astonishing work. More and more people seem to have swung into their hearts too - feeling, connecting, communicating, empathic - living less in their heads, perhaps?! Maybe the internet - the very medium through which we now express ourselves so frequently, allowing us to sit here, typing with both hands - has the added advantage of not only connecting us all up, but is also enabling both sides of our brains to work in mutual co-operation. And that HAS to be a good thing – right? !